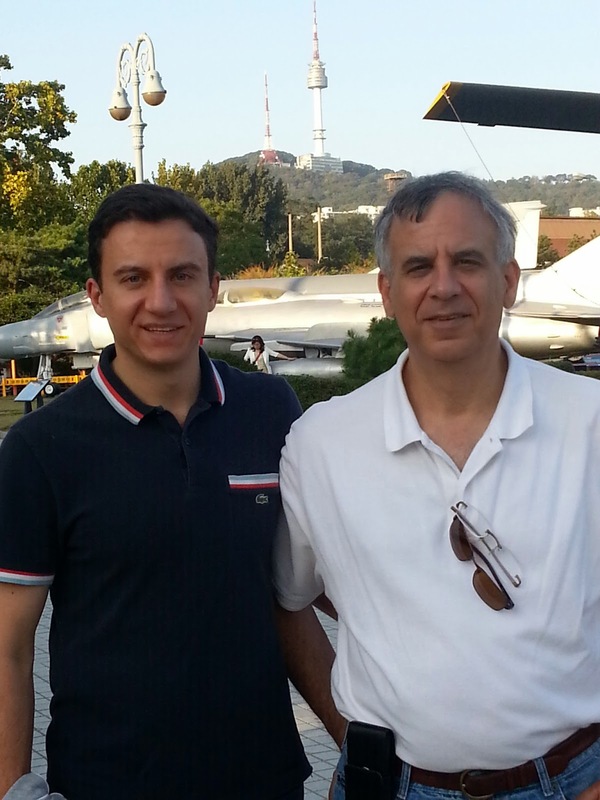 When I first moved to Korea, I certainly thought my father would be the parent to visit first. After all, this is the parent who racks up frequent flyer miles in his independent consulting gig. The parent who worked for a Japanese company at one point, and has traveled to South Africa, Australia, India and Bangladesh for work. Yes, even Bangladesh. So I was surprised when my mother beat him to the punch. Apparently my father was "too busy" and "looking for the right time" to visit. 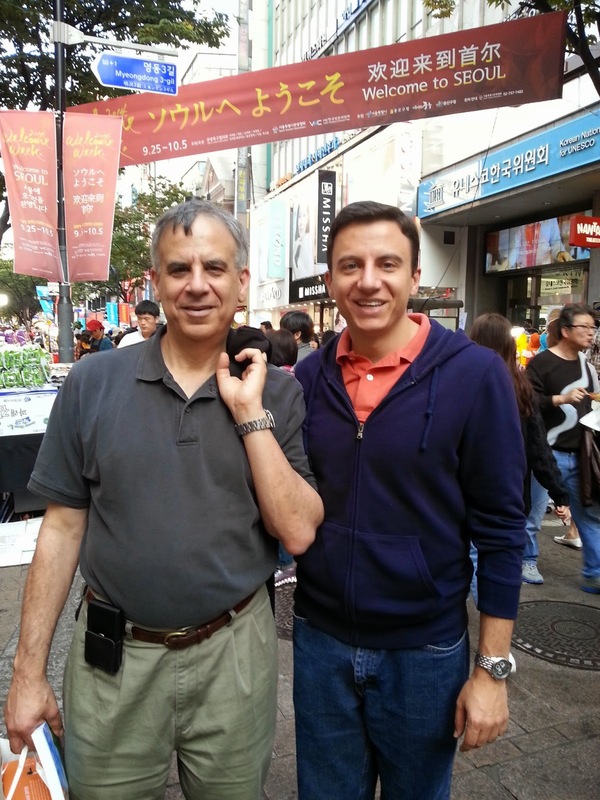 Well, it took him 2 years but my father finally came to Korea in early October, almost exactly at the same time as my mother visited in 2013. Early fall's weather once again did not disappoint – the climate was nearly perfect, sunny and mild every day of my father's visit. He said, "this is like San Francisco", to which I said, "Well, why don't you wait here six weeks for winter to arrive!" 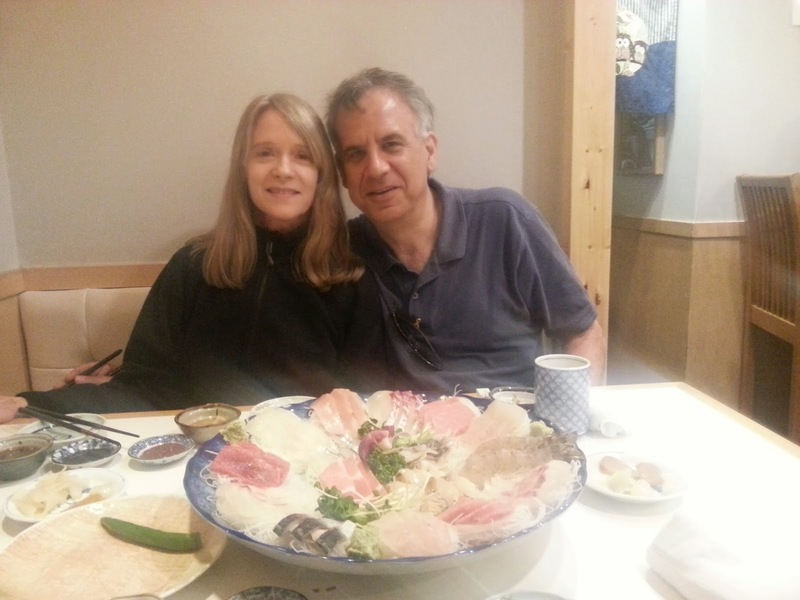 My father came with his wife Jane (my stepmother) and found a nice Airbnb rental apartment on the east side of Seoul. They were in a very Korean area and not all that close to my house, but seemed like a nice, less expensive option compared to Seoul's expensive hotels. Next was the chaotic craziness of Myeongdong, definitely too crowded and overwhelming for my guests, followed by a walk through Namdaemun Market. We sat down there for some street food at a tent table, haemul pajeon with makgeolli – that is, seafood pancake with rice wine. My guests were delighted, but the rice wine was not good for overcoming jet lag, and my sleepy father and Jane went home early. Monday to Wednesday I needed to work – similar to my mother's visit I simply didn't have enough vacation days to play tour guide every day – and my guests were good diligent tourists figuring out what to see using their Lonely Planet book and their intuition. On Monday they walked through Bucheon Hanok Village, along the Cheongyecheon Stream, visited Gyeongbok Palace, and found their way back to my favorite tea house in Insadong! On Tuesday and Wednesday they got brave enough to travel to Andong. Of course, they would not have figured out the train schedule without my advice – the Korail website was difficult for them to use – but it all worked out. Originally they wanted to visit Gyeongju as well, but that proved too ambitious for two foreigners to figure out by themselves. Thursday was a holiday for me so I was once again able to accompany my guests through Seoul. Rather than visiting the DMZ, which is novel but I think overpriced and overrated, I took my guests to the War Memorial of Korea. My father is a history buff and he greatly enjoyed learning about the causes and timeline of the devastating Korean conflict 60 years ago. Our guide was a talkative, overzealous ajeoshi but perfect for my patient guests. We ate Korean food for dinner in Dongdaemun, where my guests marveled at the Dongdaemun Gate and the modern, exotic-looking Dongdaemun Design Plaza building. There we saw an unexpected hanbok fashion show taking place to celebrate Hangeul Day, recognizing the creation of the Korean alphabet in the 15th century. Friday was my father's birthday, and my guests were once again late out the door (turns out that they had brought plenty of work with them on their Korean holiday, tsk tsk) and we met at the crowded Changdeok Palace to take the Secret Garden tour. Though a workday in Korea, I received a free holiday for "parents 60th birthday"! Yay! Though technically my father turned 61 that day I felt totally justified as I was not able to fly home to the USA to see my father's birthday the year before. For the Secret Garden the English-language tour was completely full, so we instead booked the next Korean-language tour 15 minutes later and raced ahead to learn about the Secret Garden in a language which we could understand. However, my guests would have preferred to walk around on their own without a tour at all – they felt "herded like cattle" as we were rushed from place to place. They enjoyed the peaceful neighboring Changgyeong Palace more. For my guests' final Saturday in Seoul, I took them for the easiest decent hike that I know near the city, Cheonggyesan. This place is easily reachable by subway and I am glad that we decided for an easier hike – my father had absolutely no hiking gear (major faux pas in Korea) and Jane was battling an ailing knee. However we made it to the top of the hike and my guests were treated to a view (albeit smoggy) of the massive Seoul city. For dinner we wandered back to the heavily Korean neighborhood were my guests were staying in Gwangjin-gu and I did my best to order at a cheap squid restaurant with no pictures on the menus. I discovered that my father has a liking for baekseju, a light rice-based liquor with hints of herbs and slightly sweet. He got a little drunk! 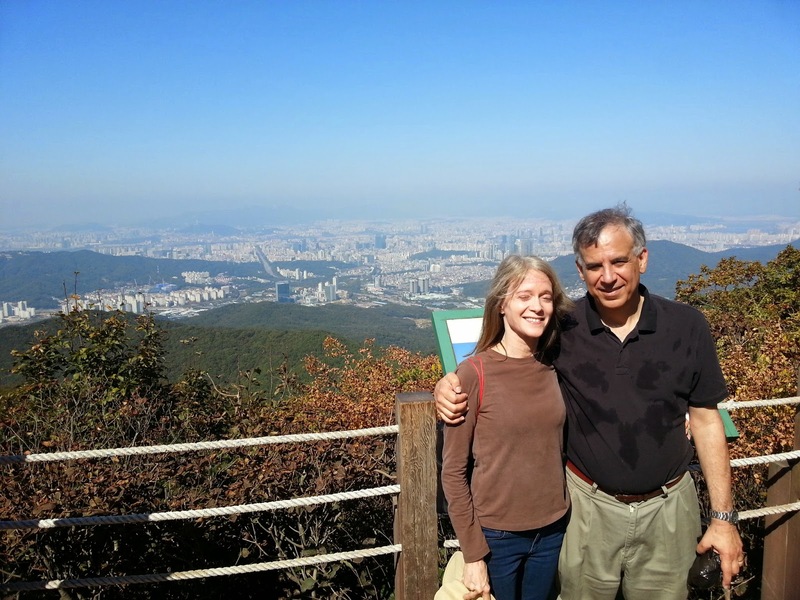 Though they never truly recovered from jetlag, my father and Jane greatly enjoyed visiting Korea. Like all of my guests who have visited the Hermit Kingdom, they came away with preconceptions altered and a sense for Korea's place in the world.